Left to right: ITER Technical Coordination Assistant Helen Hinton, who coordinated the 75-odd UIT meetings; Anatoli Krasilnikov, head of ITER Russia; Kijung Jung, head of ITER Korea; Ned Sauthoff, head of US ITER; Sergio Orlandi, head of ITER's Central Engineering and Plant Directorate; and Eisuke Tada, head of the Japanese Domestic Agency. The Unique ITER Team (UIT), introduced six months ago by ITER Director-General Osamu Motojima following discussions with the ITER Members, started off with a symbolic seating arrangement: at last August's Special Management Advisory Committee (MAC) meeting, the heads of the seven ITER Domestic Agencies sat with ITER Organization management and not, as had been customary, with the MAC members. Only a small change in protocol, perhaps, but one conveying a much larger meaning: the ITER Organization and the Domestic Agencies share the same goal, and only an integrated team resolutely pulling in the same direction can address the common challenge of schedule recovery. 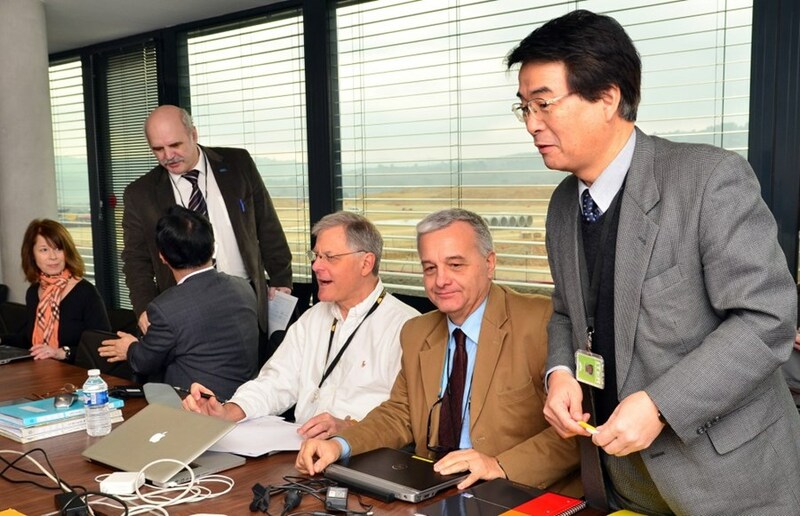 As the heads of the seven Domestic Agencies and their closest collaborators convened for five days last week at ITER, participating in more than 75 meetings and countless open and candid discussions and exchanges, it was obvious that the Unique ITER Team had evolved from "concept" into a very concrete reality, rich in content and strong in personality. Kijung Jung (left) working on a document with Japanese colleagues Hideo Nakajima and Kiyoshi Okuno. Most striking was the atmosphere of these meetings and discussions—something akin to the spirit of a sports team or the enthusiasm of a group of explorers setting out for an exciting voyage. "In coordinating an international project as large and as complex as ITER, communication is essential," says Ned Sauthoff, the head of the US Domestic Agency. "And true communication requires more than just exchanging through 2D video. In agreement, as in disagreement, an in-person meeting gives you a much better sense of the other person's reaction. It improves the interpersonal relationship and enables trust." His European colleague, recently appointed F4E Director Henrik Bindslev, is of the same opinion. What is at stake beyond the agenda of each meeting, he says, is "creating relationships" and forming what he calls "professional friendships." The UIT week provided several opportunities for Procurement Arrangement signatures. 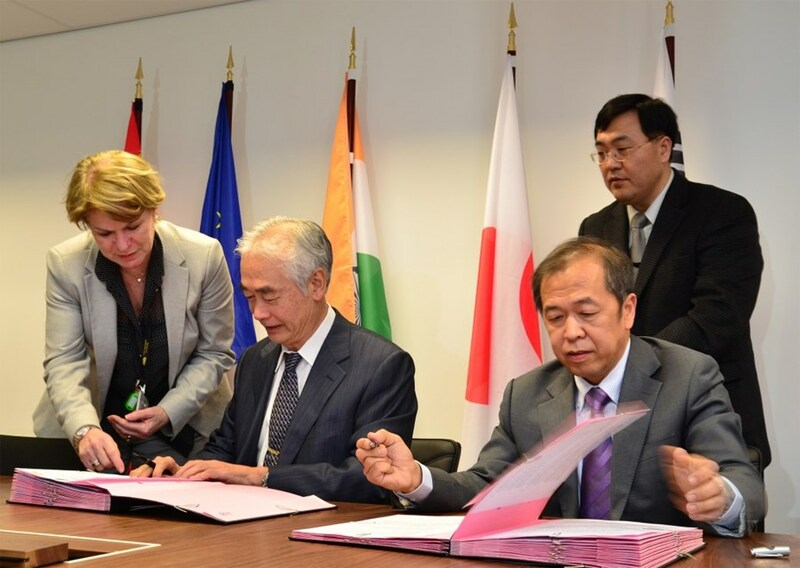 From left to right: Françoise Flament, head of ITER's Procurement & Contract Division; ITER Director-General Osamu Motojima; Luo Delong, head of ITER China; and ITER Procurement Responsible Officer Houn Ko. Drawing from his experience as chairman of the European Energy Research Alliance (2010-2012), Bindslev is convinced that "if people get along at the top, it's easier to build cohesion between their respective teams." Shishir Deshpande, head of ITER India, considers that the 20-odd meetings that he participated in with the ITER Organization were "very useful in identifying many critical issues which pose a risk to schedule. The outcome of the UIT week has exceeded our expectations. Both the planned meetings and those we could arrange on the spot facilitated a speedy decision-making process." For Anatoli Krasilnikov, head of ITER Russia, the UIT meeting was "definitely useful." Although he spent only two days at ITER last week—"Russia has fewer interfaces than other Domestic Agencies," he explains—he particularly appreciated having, like the other Domestic Agencies, a permanent office at his disposal in the ITER building. The Director of the European Domestic Agency, Henrik Bindslev (left), takes a seat facing DG Motojima and ITER India's Indranil Bandyopadhyay for a quick sandwich at the ITER cafeteria. "We have demonstrated that UIT works," assures Eisuke Tada, the head of the Japanese Domestic Agency. "It was perceptible: we were happy to be together, sharing, discussing and, most important, deciding. UIT significantly improves communication, not only between the ITER Organization and the seven Domestic Agencies, but also between the Domestic Agencies themselves." Of course, the UIT is just getting underway. "This second UIT week was much better than the previous one in January," says Luo Delong, head of the Chinese Domestic Agency. "We've taken decisions, but we need to take more." 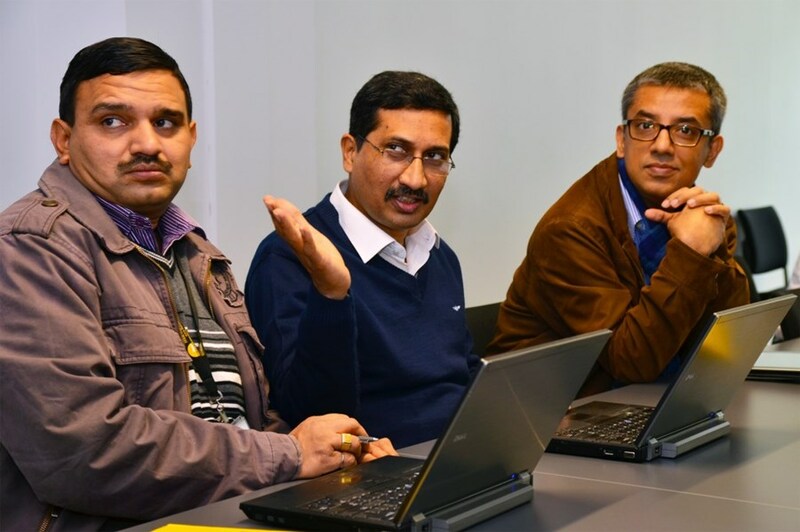 Shishir Deshpande (centre) head of ITER India, with colleagues Anil Bhardwaj (left) and Indranil Bandyopadhyay. For Kijung Jung, head of the Korean Domestic Agency, "the UIT is a very sound investment to recover the project's schedule. It promotes mutual trust, understanding and confidence. Spending a whole work week with your colleagues helps you understand their difficulties—and helps them understand yours. UIT is an improved management tool which translates directly into keeping the project within schedule and cost." View a selection of UIT pictures here.